Despite the icy roads, a multitude of runners decorated Hanover’s wintry streets last weekend. However, no one was craving hot cocoa or cider on this winter day. Instead, athletes were focused on their upcoming events. It was the 44th Annual Dartmouth Relays — marking a peak in the winter track season for many athletes here at Hanover High. Competition in the Leverone Field House ramps up at this point; since, qualifying standards for UNH and the state meet are vigorously sought after. Because of the relatively few number of meets in the winter season, athletes are required to perform their very best at this stage. The Dartmouth Relays however, creates a perfect segue into this competitive phase of the winter season. With schools from Vermont, New Hampshire, Maine, Connecticut, New York, and even Quebec competing in the meet, the rivalry only escalates. Hanover athletes displayed many notable performances at the meet. On the girls’ team, senior Katherine Vincelette claimed a solid victory in her heat of the 400m dash, placing her in the top 11 overall. In the 300m dash, senior Sophie Bartels and sophomore Claire Messersmith continued to improve their already UNH qualifying times with a season best for Bartels. Distance team captain Aidan Bardos ran an astounding time in the 1000m, missing the state qualifying time only by a mere fraction of a second. Already with a busy list of events for states, this would have become her 4th event — an incredible achievement. The girls 4X400m relay team (Bartels, Lubrano, Messersmith, Bardos) came in 13th with a winning time for states despite missing some key individuals. The Hanover boys’ team also had some noteworthy results. Junior Phil Caffry ran an excellent race, coming in second in his heat of the 300m dash with a qualifying time for the UNH meets. Coming in just over a second later, sophomore Jonathan Klotz closely followed Caffry. Senior Ethan Demarest had an outstanding distance of 17′ 9.5″ in the long jump, qualifying him for UNH as well. The boys’ team also had a successful sprint medley team (Alibozek, Porter, Johnson, DeLucia) and 4X400m relay team (Caffry, Higgins, Brooks, Klotz). Additionally, Hanover had a 4X800m relay team (DeLucia, Hajajra, Read, Kane) for the first time this season. 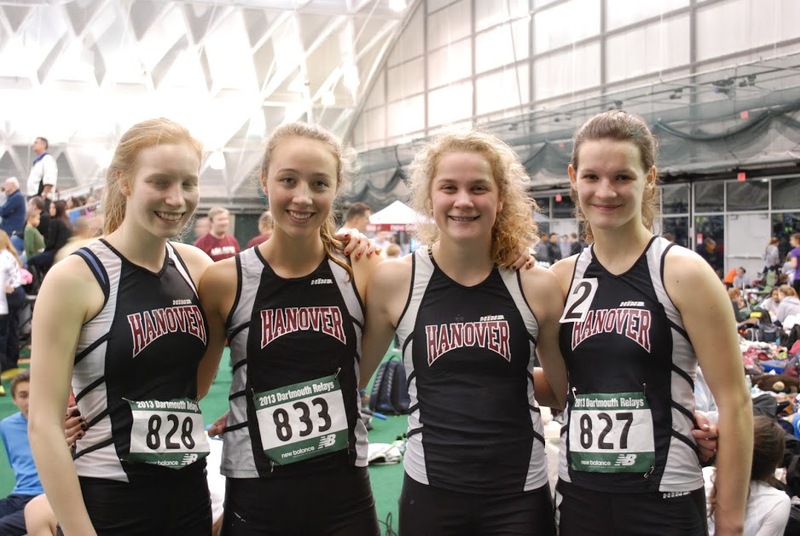 After this long and extensive meet — spanning over the course of two consecutive days — Hanover winter track and field athletes are now either at the conclusion of their competitive season or moving onto UNH and the state meet if qualified. Despite the frigid conditions during outside practices, the results of this meet show that the athletes have spent their efforts well. They have committed themselves to performing their best regardless of the wintry weather . . . with maybe a cup or two of hot cider. 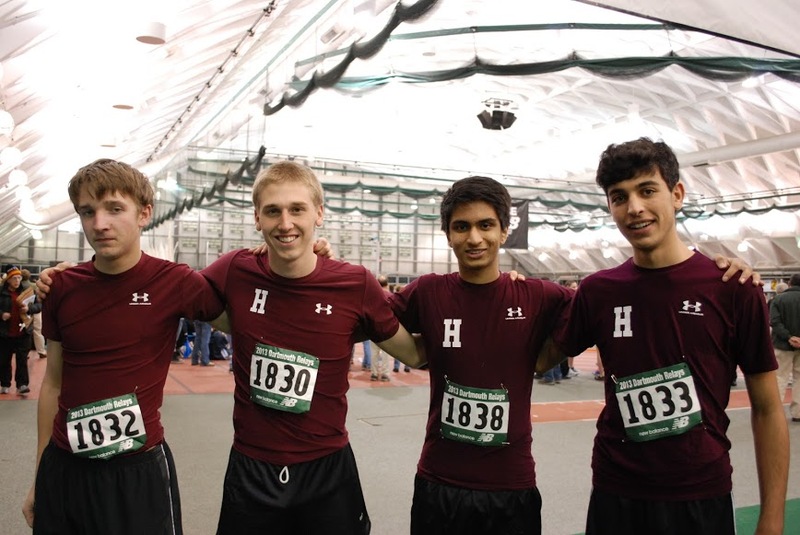 The 4X800m Boys’ Relay Team at Dartmouth Relays. Left to Right: Kieran Read, Billy DeLucia, Raj Kane, and Omar Hajajra. Photo Courtesy of Aparna Alavilli. The 4X400m Girls’ Relay Team at Dartmouth Relays. Left to Right: Sophie Bartels, Sophie Lubrano, Claire Messersmith, and Aidan Bardos. Photo Courtesy of Aparna Alavilli.